If you’ve been collecting the letters for the Daisy & Rings monogram alphabet, you’ll be happy to know that today, we’ve reached The End. Sometimes, The End is a great place to be! 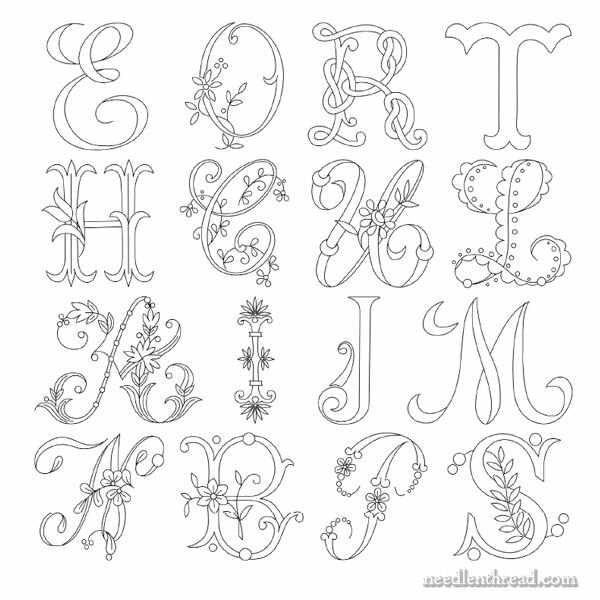 For those of you just joining in here at Needle ‘n Thread, you’ll find this complete alphabet of monogram letters available here. 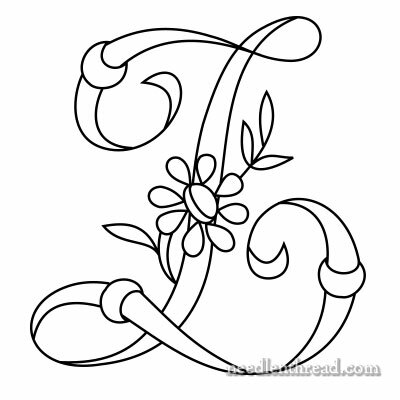 Each letter has a free PDF printable with three sizes of letters on it. And many of the articles that accompany the letters offer stitching tips and ideas, links to monogram resources, and so forth. Without further ado, here’s The End of the Alphabet – letters Y and Z.
I like this style of Y – though it’s quite upright, it’s also still very scripty. I prefer this upright letter with the swirl at the base, instead of the upward swoop that crosses over the downward stroke, like you’d find in a typical penmanship alphabet. And here’s the Z, which really does bring us to The End. If you’d like to save these letters and print them for your own use, just click on the links below, and a PDF will open in your browser. Save the PDF to your computer, and you’ll have access to the letters whenever you want them. If you choose “no scaling” on your printer (or whatever similar setting your printer offers), the letters will print at 2, 3, and 4 inches tall. You can also enlarge or reduce them on your printer or a photocopy machine. Mrs. Corbet. I do so appreciate your generosity. I have enjoyed reading all your tips and suggestions for stitching in the articles, too. Now I have to think up a project that I can use some of these letters in! Not today, though. Today I am feeling quite ill.
Ut oh! I hope you’re better soon, Sarah! The end is a great place for us. 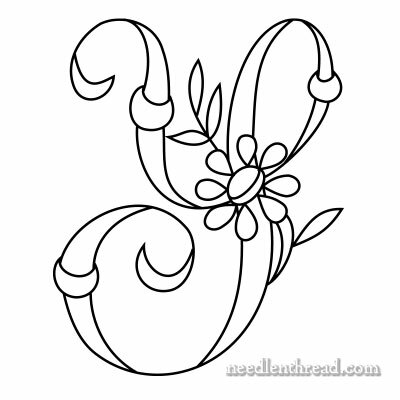 The Y of the Daisy and Ring monogram series is very pretty and would look lovely embroidered. Thanks so much for your hard work on the Daisy and Ring alphabet series and for sharing the free PDF download with us and all the lovely free patterns on Needle n’ Thread. ooooooooooooooooooh I LOVEEEEEEE this alphabet! I’ll need to stitch up some of these ASAP. By the way how is the runner going? I’ve been thinking for awhile about making my own in blue to match my house. The Hungarian Bluework runner lol! Thanks for all the trouble you take to share your knowledge with us! Won’t you give us monograms in Simple letters as the Capital Letters have finished? Previous Previous post: I Believe in UFOs!